Wild Eye Releasing has released today on DVD and Digital HD of horror producer Sean K. Robb's directorial debut 'SCARS'. A misandristic slasher, Robb puts a spin on Thelma & Louise, with a much bigger body count. 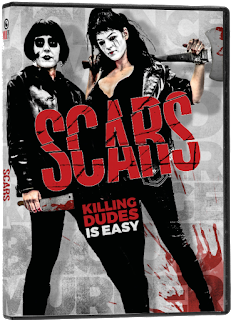 A nihilistic, misanthropic character study of modern morality and slasher terror, Scars follows two beautiful women on a violent and ruthless killing spree. Joined by their deep hatred of all men, the pair leave a path of death and destruction in their wake. The blood leaves a trail for a mysterious detective, but he could end up as their ally or their latest mutilated calling card.